Barman (Barry Bosman) once developed this prototype for a Technic car, based on the same principle as proposed by Audi RSQ [1, 2] (the car for the sci-fi movie I, Robot). Spheres instead of wheels, was the innovation then proposed by Audi and here by Barry. 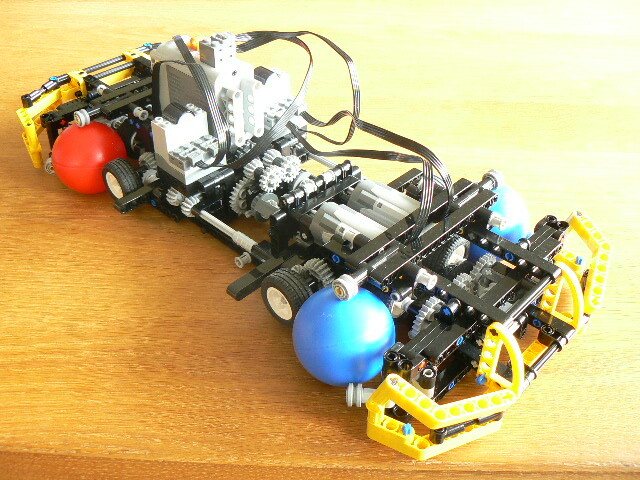 The prototype used LEGO 51mm balls (those included with the NXT 1.0 kit for instance) for wheels, but it never worked as good as Barry intended. Thus the project was canceled and never finished. However you can still find some additional photos from this proof of concept, at Barry's BS folder. I don't know exactly what was wrong, as from the video, the model seems to work pretty well! Maybe it was not following exactly the driving instructions being sent through the remote. The prototype weight and balls friction, seems to be in the origin of the problem. But anyway, Barry indicated another tentative developed much later by MrAliencat, to accomplish the same idea. This another version got its weight reduced, as a measure to improve the performance. It looked a really nice idea, if it worked good enough to support the weight from a complete and finished car model. Barman's model was way too complicated; thus very heavy. In combination with the wrong type of rubber tires it would fail if it was completed. It's not impossible to make this, but the first rule should be: save weight and keep it simple! For instance: it's totally not necessary to use differentials! So it's also a question of insight? Why do you think these are the wrong tires? Which ones would you have used instead? I noticed now, that MrAliencat, used the PF Rechargeable LiPo. This should have also helped to reduce the overall model weight, a lot. You got it right. Because of the weight and friction the system didn't work as well as I had hoped. The tires have a very good grip on the Mindstorms ball, but it is too width, so when the ball rotates in the other direction, this has a lot of friction, you don't want. Aliencat Used a smaller tire that work very well. Also the weight is better than mine. Using the differentials was just for fun and makes the car steer easier. Like anonymous said it's makes it to heavy. Also there was a 4th motor to open de doors of the car. I posted it, because I think it is still a remarkable attempt.